This article is about the government of the People's Republic of China. For the government of the Republic of China (Taiwan), see Government of the Republic of China. For governments in Chinese history, see Government of China (disambiguation). For the current Central People's Government of China, see Li Keqiang Government. We will never simply copy the system of Western countries or introduce a system of multiple parties holding office in rotation; although China’s state organs have different responsibilities, they all adhere to the line, principles and policies of the party. At the same time there has been a move to separate party and state offices at levels other than the central government. It is not unheard of for a sub-national executive to also be party secretary. This frequently causes conflict between the chief executive and the party secretary, and this conflict is widely seen as intentional to prevent either from becoming too powerful. Some special cases are the Special Administrative Regions of Hong Kong and Macau where the Mainland Chinese national laws do not apply at all and the autonomous regions where, following Soviet practice, the chief executive is typically a member of the local ethnic group while the party general secretary is non-local and usually Han Chinese. Under the Constitution of China, the NPC is the highest organ of state power in China. It meets annually for about two weeks to review and approve major new policy directions, laws, the budget, and major personnel changes. Most national legislation in the PRC is adopted by the Standing Committee of the National People's Congress. Most initiatives are presented to the NPCSC for consideration by the State Council after previous endorsement by the Communist Party's Politburo Standing Committee. Although the NPC generally approves State Council policy and personnel recommendations, the NPC and its standing committee has increasingly asserted its role as the national legislature and has been able to force revisions in some laws. For example, the State Council and the Party have been unable to secure passage of a fuel tax to finance the construction of expressways. 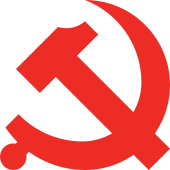 The Politburo Standing Committee (PSC), is a committee consisting of the top leadership of the Communist Party of China. Historically it has been composed of five to nine members, and currently has seven members. Its officially mandated purpose is to conduct policy discussions and make decisions on major issues when the Politburo, a larger decision-making body, is not in session. According to the party's Constitution, the General Secretary of the Central Committee must also be a member of the Politburo Standing Committee. The membership of the PSC is strictly ranked in protocol sequence. Historically, the general secretary (or party chairman) has been ranked first; the rankings of other leaders have varied over time. Since the 1990s, the general secretary, premier, chairman of the National People's Congress, the chairman of the Chinese People's Political Consultative Conference, the secretary of the Central Commission for Discipline Inspection, the party's top anti-graft body, and the first-ranked secretary of the secretariat have consistently also been members of the Politburo Standing Committee. 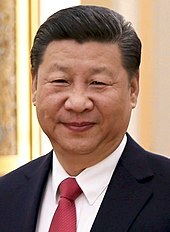 Power is concentrated in the Paramount leader, currently Xi Jinping, who heads the four most important political and state offices: He is General Secretary of the Communist Party, general secretary of the Central Committee, Chairman of the Central Military Commission, and President of the PRC. Recently, experts have observed growing limitations to the Paramount leader's de facto control over the government. The Constitution was first created on September 20, 1954. Before that an interim constitution-like document created by the Chinese People's Political Consultative Conference was in force. The second promulgation in 1975 shortened the Constitution to just about 30 articles, and contained Communist slogans and revolutionary language throughout. The role of courts was slashed, and the Presidency was gone. The 3rd promulgation in 1978 expanded the number of articles, but was still under the influence of the just-gone-by Cultural Revolution. The current constitution is the PRC's fourth promulgation. On December 4, 1982, it was promulgated and has served as a stable constitution for 30 years. The roles of the presidency and the courts were normalized, and under the constitution, all citizens were equal. Amendments in 1988, 1993, 1999, 2004, and 2018 recognized private property, safeguarded human rights, and further promoted the non-public sector of the economy. The National People's Congress (usually abbreviated NPC) is the national legislature of the People's Republic of China. With 2,924 members in 2017, it is the largest parliamentary body in the world. Under China's current Constitution, the NPC is structured as a unicameral legislature, with the power to legislate, the power to oversee the operations of the government, and the power to elect the major officials of state. 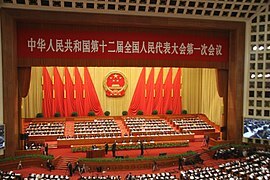 The NPC and the National Committee of the People's Political Consultative Conference (CPPCC), a consultative body whose members represent various social groups, are the main deliberative bodies of China, and are often referred to as the Lianghui (Two Assemblies). The NPC is elected for a term of five years. It holds annual sessions every spring, usually lasting from 10 to 14 days, in the Great Hall of the People on the west side of Tiananmen Square in Beijing. The NPC's sessions are usually timed to occur with the meetings of the CPPCC, and these annual meetings provide an opportunity for the officers of state to review past policies and present future plans to the nation. The fourth session of the 12th NPC was held from March 5 to March 16, 2016. The President of the People's Republic of China is the head of state. Under the PRC's constitution, the presidency is a largely ceremonial office with limited powers. However, since 1993, as a matter of convention, the presidency has been held simultaneously by the General Secretary of the Communist Party of China, top leader in one party system. The office is officially regarded as an institution of the state rather than an administrative post; theoretically, the president serves at the pleasure of the National People's Congress, the legislature, and is not legally vested to take executive action on its own prerogative. [note 1] The current president is Xi Jinping, who took office in March 2013. The office was first established in the Constitution of the People's Republic of China in 1954 and successively held by Mao Zedong and Liu Shaoqi. Liu fell into political disgrace during the Cultural Revolution, after which the office became vacant. The office was abolished under the Constitution of 1975, then reinstated in the Constitution of 1982, but with reduced powers. The official English-language translation of the title was "Chairman"; after 1982, this translation was changed to "President", although the Chinese title remains unchanged. [note 2] In March 2018, presidential term limits were abolished. The State Council is the chief authority of the People's Republic of China. It is appointed by the National People's Congress and is chaired by the Premier and includes the heads of each governmental department and agency. There are about 50 members in the council. In the politics of the People's Republic of China, the Central People's Government forms one of three interlocking branches of power, the others being the Communist Party of China and the People's Liberation Army. The State Council directly oversees the various subordinate People's Governments in the provinces, and in practice maintains an interlocking membership with the top levels of the Communist Party of China. Currently the Premier of the State Council is Li Keqiang and the Vice Premiers are Han Zheng, Sun Chunlan, Hu Chunhua and Liu He. Together with the five State Councilors, they form the inner cabinet that regularly convenes for the State Council Executive Meeting. The Central Military Commission exercises the command and control of the People's Liberation Army and is supervised by the Standing Committee of the National People's Congress. The state CMC is nominally considered the supreme military policy-making body and its chairman, elected by the National People's Congress, is the commander-in-chief of the armed forces. In reality, command and control of the PLA, however, still resides with the Central Military Commission of the Chinese Communist Party Central Committee. Currently the chairman of the Central Military Commission is Xi Jinping. The National Supervisory Commission of the People's Republic of China is the highest supervisory (anti-corruption) agency of the People's Republic of China. It supervises all public officials who exercise public power, at the same administrative ranking as the Supreme People's Court and Supreme People's Procuratorate. Its operations are merged with the Central Commission for Discipline Inspection of the Communist Party of China. It replaces the former Ministry of Supervision. Currently the director of National Supervisory Commission is Yang Xiaodu. 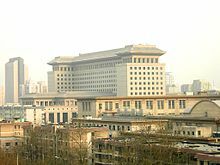 The Supreme People's Court is the highest court in the judicial system of the People's Republic of China. Hong Kong and Macau, as special administrative regions, have separate judicial systems based on British common law traditions and Portuguese civil-law traditions respectively, and are out of the jurisdiction of the Supreme People's Court. The judges of the Supreme People's Court are appointed by the National People's Congress. As of 2018[update], the President of Supreme People's Court and the Procurator-General of Supreme People's Procuratorate are Zhou Qiang and Zhang Jun separately. The governors of China's provinces and autonomous regions and mayors of its centrally controlled municipalities are appointed by the central government in Beijing after receiving the nominal consent of the National People's Congress (NPC). The Hong Kong and Macau special administrative regions (SARS) have some local autonomy since they have separate governments, legal systems, and basic constitutional laws, but they come under Beijing's control in matters of foreign policy and national security, and their chief executives are handpicked by the central government. Below the provincial level in 2004 there were 50 rural prefectures, 283 prefecture-level cities, 374 county-level cities, 852 county-level districts under the jurisdiction of nearby cities, and 1,636 counties. There also were 662 cities (including those incorporated into the four centrally controlled municipalities), 808 urban districts, and 43,258 township-level regions. Counties are divided into townships and villages. While most have appointed officials running them, some lower-level jurisdictions have direct popular elections. The organs of self-governing ethnic autonomous areas (regions, prefectures, and counties)—people's congresses and people's governments—exercise the same powers as their provincial-level counterparts but are guided additionally by the Law on Regional Ethnic Autonomy and require NPC Standing Committee approval for regulations they enact "in the exercise of autonomy" and "in light of the political, economic, and cultural characteristics of the ethnic group or ethnic groups in the areas." ^ Ralph H. Folsom, John H. Minan, Lee Ann Otto, Law and Politics in the People's Republic of China, West Publishing (St. Paul 1992), pp. 76–77. ^ China bites the bullet on fuel tax. Rsc.org (2009-01-01). Retrieved on 2013-07-21. ^ Bbc News. BBC News. Retrieved on 2013-07-21. ^ "China's Next Leaders: A Guide to What's at Stake". China File. 13 November 2012. Archived from the original on 2013-02-10. Retrieved 18 November 2012. ^ Higgins, Andrew (2011-01-16). "Hu's visit spotlights China's two faces". The Washington Post. The Washington Post Company. Retrieved 2011-01-17. ^ International Parliamentary Union. "IPU PARLINE Database: General Information". Retrieved 2017-08-06. ^ "State Structure of the People's Republic of China". 中国人大网. The National People's Congress of the People's Republic of China. Retrieved 2016-09-29. ^ "The National People's Congress of the People's Republic of China". Retrieved 2016-11-08. ^ Heilmann, Sebastian (2017). China's political system. Rowman & Littlefield. pp. 76–80. ISBN 978-1-4422-7736-6. ^ "People's Republic of China Supervision Law (draft)". China Law Translate. China. 6 November 2017. Retrieved 27 January 2018. ^ "Why should the National Supervisory Commission merges its operations with the Central Commission for Discipline Inspection of CPC?(为什么中央纪委与国家监察委员会要合署办公？)". Website of CCDI&NSC. China. 2 Feb 2018. Retrieved 2 April 2018. This article incorporates public domain material from the Library of Congress document: "China: A country study". Federal Research Division. Government and Politics. This page was last edited on 4 April 2019, at 13:11 (UTC).